Could it be that employees and candidates get it – that there is a difference between what a company says and what it does? Could this be why there is such emphasis on the use of Glassdoor.com, Careerbliss.com, LookBeforeYouLeap.net, Vault.com and many other websites that provide a chance to review a company, what it’s like to work there, the interview process, and salary offers by candidates during the career search process? Real people providing real reviews – perhaps more accurately, or at least more bluntly, than any internal survey. Employers place a lot of stock in candidate fit when making employment decisions. It is important for companies to make the right decision, but in this candidate driven market, it is equally important for the candidate (external or internal) to apply to the right company or department. Unfortunately, with the disconnect that happens between ethical and corporate culture, this is truly a challenging task for candidates, employees, and employers. Cultural fit is not limited to hiring the right candidate for an open position, it influences nearly all employment decisions to one degree or another. How does that impact the quality of our employment decisions? What risk exposure does this cause the company? How does this impact engagement, retention, and recruitment? In fact, a disconnect between the ethical and corporate cultures can have significant consequences for an organization: undesirable turnover, decreased overall retention, decreased engagement, decreased employee performance, increased rates of misconduct, and lack of innovation for continued growth just to name a few. Unless the organization works diligently to monitor and keep the two in alignment, the consequences may go largely unnoticed. The organization will end up chasing rabbit holes, putting forth a lot of effort in the wrong places and never truly solving the problem. Take a closer look at your retention, engagement, turnover, performance, top line revenue, and bottom line profits. If you think they are good, how much better could they be if there was better alignment between the ethical and corporate cultures? If they are poor, try realigning the two cultures. Like much of what we do in Human Resources, it is nearly impossible to prove a negative – the lawsuit that never happened, the turnover that was prevented, the government fines that were avoided. However, make no mistake, alignment between the ethical and corporate cultures of organizations have a huge impact on morale, engagement, performance, retention, and a whole lot more. When conducting your gap analysis, be sure to review any exit interviews that you perform (and if you don’t conduct any exit interviews, it may be time to start). This will provide some good feedback as to what caused the individuals to leave the organization. 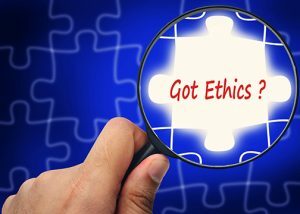 For terminations, it is important to review paper trails to see if the decisions that were made truly align with the ethical culture. Compare the situations with your Code of Business Conduct. Review the company values. Did the decision to terminate align with the code of conduct and company values? Was there any other alternative to termination that could have been implemented? Did the employee who resigned cite any actions or behaviors by subordinates, peers, or management that contradict our ethical culture? If yes, is this an isolated case or is this identified gap indicative of the actual corporate culture and a larger problem? Another place to look is the internet. Act as if you were an external candidate and researching your own company online to see if you would be a good fit. Check out the websites mentioned above and see what others – current and past employees – are saying about the company. Is there a gap between the culture they describe and the ethical culture? Is that an exception or is it indicative of the actual corporate culture? Earns employees’ trust and confidence. Towers Watson’s 2014 Global Workforce Study their most recent study, reflects the same – that Leadership is still the most important driver but goes a step further reflecting that it is the most important driver for both sustainable engagement overall AND the components of sustainable engagement (Engagement, Energy, and Enablement). Most obvious is, “Behaves consistently with the organization’s core values, “a direct connection to the ethical culture of the organization. But in fact, all four of the listed behaviors and actions are achieved when leadership is properly aligned with the ethical culture of the organization. 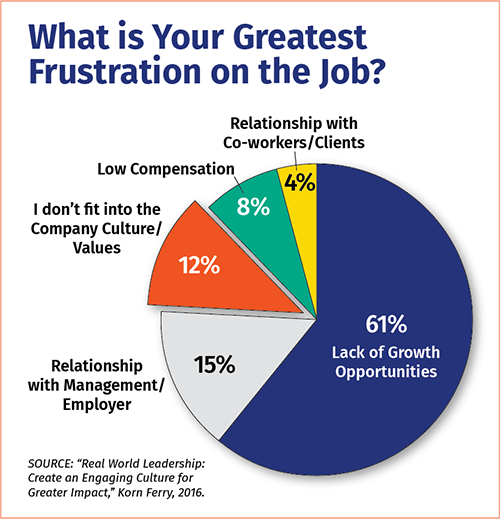 Korn Ferry’s February 2016 report Real World Leadership: Create an Engaging Culture for Greater Impact asked “What is your greatest frustration on the job?” Respondents cited, “Lack of growth opportunities” as their greatest frustration. Again, the most obvious is, “I don’t fit into the company culture/values.” However, all of them can also be positively impacted by better alignment between ethical and corporate culture. For example, nearly every company espouses to some degree or another the importance of their employees. But how can a company demonstrate this is true, how do their actions align with the ethical culture? Do they provide for career advancement or do they hire almost exclusively externally? Do they provide training and development opportunities? Do such opportunities lead to increases in compensation for employees? Couldn’t the relationships between management, employer, and co-workers be improved through better training and development? If the organization invested in the training and development of its people, wouldn’t that help them to feel as though they are a better fit into the company culture? The war for talent is HERE! There are more open positions today than there are people to fill them. As the Baby Boomer generation continues to move into retirement or reduced roles and the Millennial generation grows in the workforce, companies are battling more and more intensely for the very same talent pool. Anything a company can do to retain talent, to reduce unwanted turnover and manage appropriately the desirable turnover will be critical to the long-term success and future growth of the organization. Be sure your organization is not its own worst enemy. Alignment between its ethical and corporate culture will improve transparency – a key feature that Millennials find attractive in an organization – and help ensure sustainable employee engagement and future growth opportunities. That is a good tip especially to those new to the blogosphere. Brief but very accurate info. Thanks for sharing this one. A must read post! Really appreciate that you liked it. Hopefully this is a good word of caution to all businesses to re-examine their cultures. BEST Human Capital & Advisory Group is prepared to help companies identify disconnects and develop strategies to realign to improve overall results for your organization. Feel free to contact us for more information about our Advisory Services and how we can help your organization improve performance and reduce risk exposure.